INSIDE THE GERMAN SHEPHERD DOGS WORLD: HOW GOOD ARE GERMAN SHEPHERDS WITH CHILDREN? HOW GOOD ARE GERMAN SHEPHERDS WITH CHILDREN? As all of us German Shepherd Dog lovers believe, there is no better companion and guardian to ones family than this breed of dog. But really how good are they with children? Is this a breed of dog that you feel safe with leaving your kids alone with? Are you comfortable leaving the room knowing that they won’t bite your child? Would you trust your child’s life with this dog? I suppose the best answer to my questions would be……it depends. It all comes down to some fundamental principals and understanding about this dog and all dogs in general. What’s this dog’s predisposition or genetics in his pedigree? Does this dog come from a long line of good tempered dogs? (And even this is no guarantee what your dog will be like). Equally important is the socialization of the dog. Right from the time the dog is a young puppy and throughout the remainder of his life, socialization is a must especially with a breed that is known to be suspicious of strangers. Has your dog been raised with children? So alright then, your dog is excellent with your child……but what about your child’s friends? How friendly is he with other children? Does he tolerate rough housing? How is he with children crawling all over his back and pulling his hair or ears? If one of your children’s friends is punching and fighting with your child, what would your dog do? Would he feel that he would have to defend your child? Several months ago, I was watching friends two young boys (6 & 8) years old. I’ve known these two boys since they were born and they are very rambunctious, high energy type of kids. Well my friend owns one of those “designer” dogs….poodle/golden retriever. They’ve had him since he was an older puppy. He’s almost four years old now. He has a marvelous disposition and puts up with an awful lot from these two wild boys. Most of the time he plays right along with them, but on this day I noticed after he had enough of them, he went behind the chair that I was sitting in and tried to hide from those two little “terrors!” He was letting them know that he had had enough and he was looking for a place to get away from them. I believe when you raise animals with children that the children need to be taught respect and kindness towards animals. They should never be allowed to tease or hit the dog. I also believe that you shouldn’t leave your children unattended with your dogs especially when your child is in one of their rambunctious moods. Sometimes the dog snaps out at the child in self defense. Other times like my friends dog, they will look for a place to hide to get away from their tormentors! We can never be 100% sure of what our dogs are going to do, now matter how long we’ve lived with them or think that we know them. How many times have you heard the stories where the owner will tell someone, “Oh it’s alright, you can come in the house. My dog is friendly. He doesn’t bite?” The person comes in and now he has a scar to remind him of the “friendly” dog that doesn’t bite. It’s not unheard of to see a German Shepherd turned into a shelter because of a new baby that was born or small children conflict with the dog. The dog is protective, he’s territorial, and his emotional needs for his master are enormous. They want and need to be included in the everyday activities of his family. If he is locked away when a new baby comes in the home, then he may become jealous of the new addition to the family. We must remember that very young children don’t understand the proper behavior around a dog. They are quick and do things without thinking of the consequences of their actions so constant supervision is a must! The German Shepherd that is raised with children loves them because they are a part of his family. But here again, the children and dog shouldn’t be left unsupervised. The German Shepherd Dog is a herding breed and they have a natural prey drive. Children love to run around and the dog may enjoy the game, but can become overly excited and start pulling the child by his clothes around the floor with no intention of hurting him, but this is when accidents can happen. 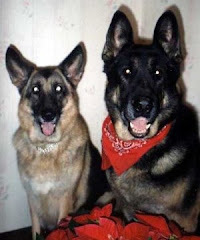 Oh there are wonderful stories of the German Shepherd and HIS children! The kid can go into the dog’s bowl while he’s eating. He can take his toys away from him. He may even fall asleep on top of him. The dog may be devoted to the child sitting and whining by the door when the child leaves for school. There’s hundred’s of pictures to attest to the love of this breed with his small master, but it’s not true for every dog. Every dog is an individual and must be dealt with as such. It doesn’t mean that we demand anything less from him. It means we know the personality of this particular dog and we know how tolerate he is and what we may expect from him. It is important to teach BOTH child and dog what you will and will not tolerate. You must always remain the pack leader. Training the dog to do what you want him to do is of the utmost importance and so is it as important for the child. In order for the child and dog to co-exist, they must both be taught how to properly get along with one another. You want your dog to be gentle and kind to your child but it’s equally important that the child is as gentle and kind to the dog. If a child is taught from a very early age how to properly interact with a dog, that child and dog can be the best of buddies. The dog might go everywhere with the child. He may even sleep in his bed. There is nothing more beautiful than a child with his dog, especially ones that love and respect one another. These relationships your child has with his dog can be some of the most important and loving relationships your child may ever know. It may help contribute to the kind of loving adult that he may become all because he loved and was loved by his dog! From the book: "Living with kids and dogs without losing your mind: Parenting books say control your dog; dog-training books say control your kids. The reality is far more complex and goes way beyond placing blame on either children or dogs for being who they are. ~ Living with Kids & Dogs . . . Without Losing Your Mind provides busy parents with simple, realistic advice to help ensure that the relationship between their kids and their dog is safe and enjoyable for all. You will learn how to • Help your child and dog develop a strong relationship, built on trust and cooperation • Set your family up for success with a minimum of effort • Recognize canine stress signals and know when your dog is getting worried about normal kid activity • Identify serious behavior problems before someone gets hurt • Provide specific help for managing the interactions with dogs through each stage of your kids’ lives from infancy through the teen years • Prevent your child from becoming part of a growing statistic—children who have been bitten by a dog. OLD DOGS ARE THE BEST DOGS! IS YOUR DOG'S PERSONALITY COMPLEMENTARY TO YOURS? ARE YOU LIVING WITH A COMEDIAN? GOT FRONTS - OR WHY IS IT SO HARD TO GET THEM? CAN A BRED BY EXHIBITOR DOG WIN THE MAJOR POINTS? THE CRATE - DEN OR A JAIL SENTENCE? CO-OWNERSHIPS, GOOD OR POOR INVESTMENTS? DOES YOUR DOGS POOR MANNERS REFLECT ON YOU? HOW IMPORTANT IS IT TO WIN UNDER THE BEST JUDGES?